Blossom Bucket stocks seasonal blocks, chickens, roosters, sheep, farm animals of all types, primitive houses, roosters, and more! 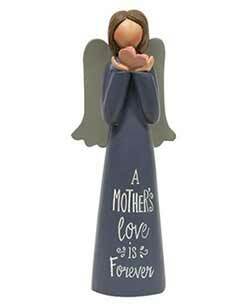 Angel holds a small pink heart, and wears a blue dress; Engraved on the front is "A mother's love is forever." 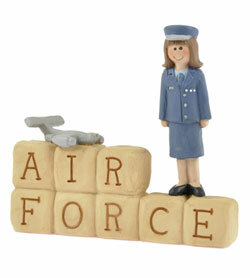 Air Force Block with Girl, by Blossom Bucket. Measures approx. 3 x 3.3 inches. A Suzi Skoglund design. Resin. A 2011 design. Photo courtesy of Blossom Bucket. 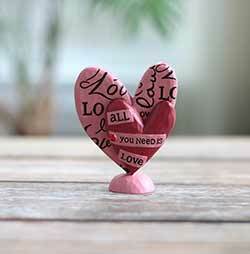 This pretty pink heart is engraved with elegant "love" lettering, with a red heart layered in the front, accented with a jewel. 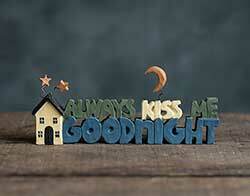 Always Kiss Me Goodnight resin accent word, by Blossom Bucket. Artist Barbara Lloyd. Measures 5.75"L x 2.25"H. Resin. This black and white rooster is perched atop a box decorated with a patriotic banner. 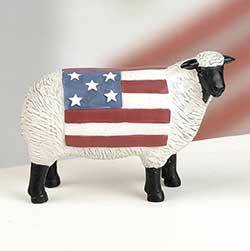 This black and white sheep wears an American-flag-inspired blanket. Another Day in Paradise Cabin, by Blossom Bucket. Base reads: Just another day in paradise! Measures approx 5.5 x 7.5 inches. A Robin Davis design. Resin. 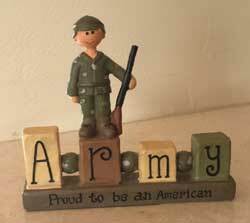 Army Bead Block, by Blossom Bucket. Measures approx. 4.00 x 3.25 inches. A Suzi Skoglund design. Resin. 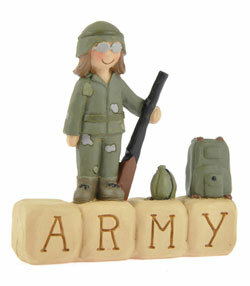 Army Block with Girl, by Blossom Bucket. Measures approx. 2.75 x 2.6 inches. A Suzi Skoglund design. Resin. A 2011 design. Photo courtesy of Blossom Bucket. 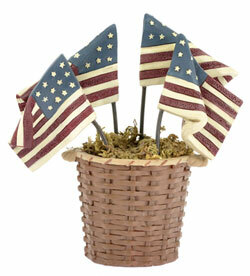 Basket of Flags, by Blossom Bucket. Measures approx. 4.5 x 4.5 inches. A Deb Strain design. Resin. A 2012 design. Photo courtesy of Blossom Bucket. 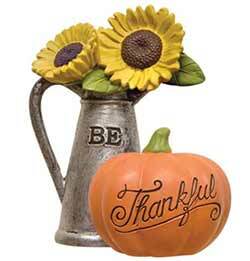 This little pumpkin figurine is accented with a pitcher of sunflowers, and reads: "Be thankful. 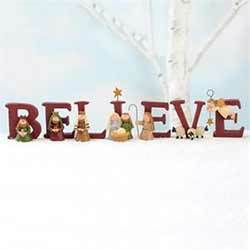 One of our most popular designs for Christmas, this "believe" word set doubles as a miniature nativity seen! Interspersed in the letters are tiny nativity figures. 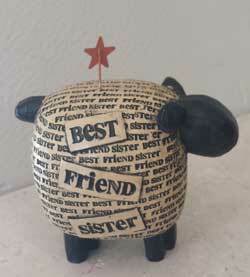 Best Friend Sister Sheep, by Blossom Bucket. 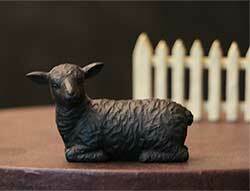 This black and ivory sheep reads Best Friend Sister. A Barbara Lloyd design. Measures 3 x 3.25 (inches). Made of resin. 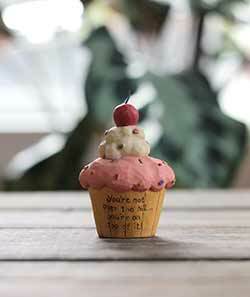 Great for a little birthday accent, this cupcake miniature reads: "You're not over the hill...you're on top of it!" Black Sheep, by Blossom Bucket. 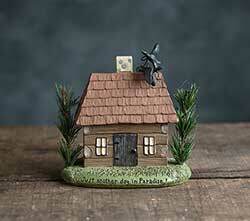 This sweet little guy is the perfect addition to your farm animal collection! Measures approximately 1.5 x 3 inch. A Blossom Bucket Original design. Resin. 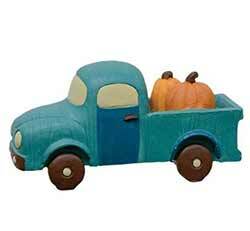 A beloved country icon, the retro style pick up truck is a pretty blue color and is stacked with pumpkins for fall! 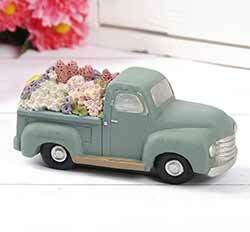 A pretty robin's egg blue color, the bed of this vintage truck is full of flowers in pin, yellow, and purple. This darling little "boo" block has a Jack o'Lantern for an "O," and is topped with a sweet ghost! A Barbara Lloyd design. 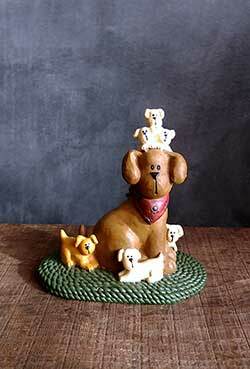 Brown Dog & Pups on Rug, by Blossom Bucket. This puppy family rests on a green rug. A Suzi Skoglund design. Measures 4 x 4.25 inches. Resin. 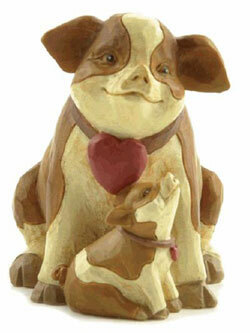 Brown Pig and Piglet, by Blossom Bucket. A Betty Padden design. Stands about 2.5 inches tall. Made of resin. 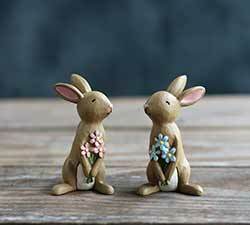 This set of two sweet bunnies hold armfuls of flowers - one pink, one blue. Perfect for displaying all spring long! Butcher Block with Ingredients, by Blossom Bucket. 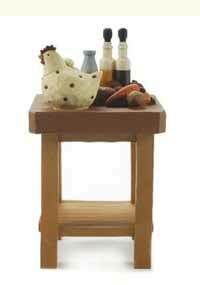 A darling kitchen accent, this tiny butcher block is accented with a chicken, oil and vinegar bottles, produce, and more! A Dan DiPaolo design. Measures 4.5 x 2.5 inches. Resin. 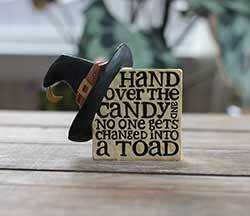 Great for a small halloween accent, this shelf sitter is accented with a witch hat, and reads: "Hand over the candy and no gets changed into a Toad." 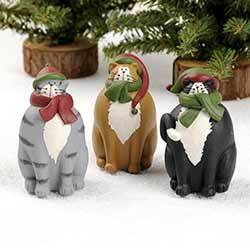 Add a country kitty to your holiday decor this winter with one of these cats, dressed in a scarf and hat! 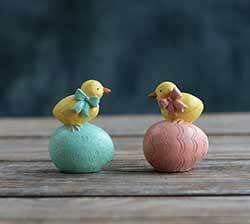 This set of two baby chicks wear oversized bows and rest on Easter eggs - one is pink, one is pastel blue. 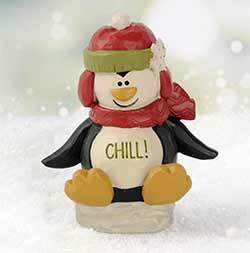 This penguin figurine is dressed in a scarf and hat, sits on a block of ice, and reads "Chill!" 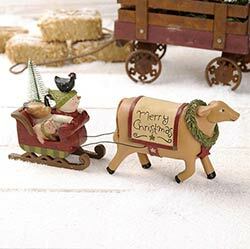 Christmas Cow, Pig, or Goat Ornament, by Blossom Bucket. A Barbara Lloyd design. Sold individually from the three shown - Choose the Goat, Cow, or Pig. Measures 2.75 x 2.5 inches. Made of resin. 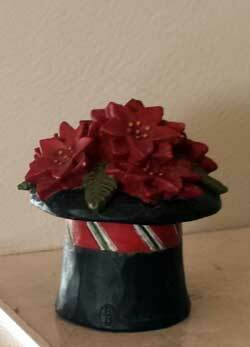 Christmas Magic Hat, by Blossom Bucket. A Robin Davis design. Measures approx 2 inches. Made of resin. 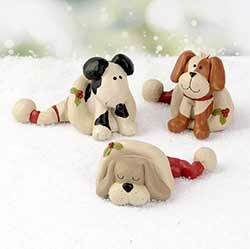 Set this "Christmas" word figurine on a shelf, mantel, or desk to invite the spirit of the season! 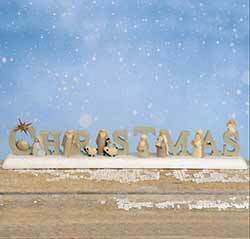 Letters are ivory in color and accented with superfine glitter. 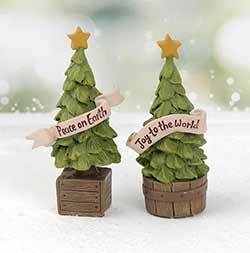 Add to your Christmas miniature display with one of these fir trees in wooden crates, with message banner. Sold individually. 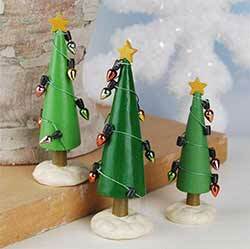 Add to your Christmas miniature display with this set of evergreen trees, decked out with string lights! 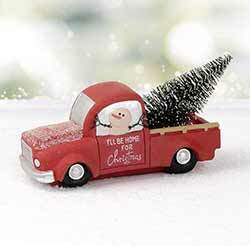 A red pickup truck with a snowman in the driver's seat. 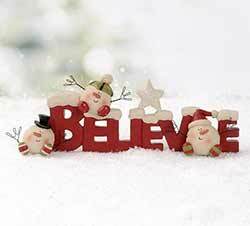 There's a bottlebrush tree in the back, and on the side it reads: "I'll be home for Christmas." 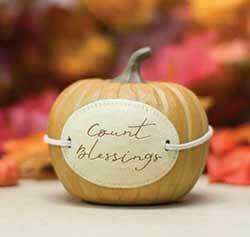 Resin pumpkin with a patch-like design that is engraved with the phrase, "Count Blessings." Dashing through the snowy farm, we have a brown cow pulling a sleigh filled with a snowman, goose, chicken, pig, and little tree! 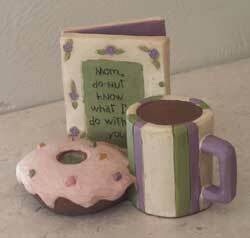 Do-Nut Mother's Day Card & Treat, by Blossom Bucket. A Barbara Lloyd design. Front of book reads: Mom, I do-nut know what I'd do without you. Inside reads "love you" on one side, and the other side is blank for you to write your own message. 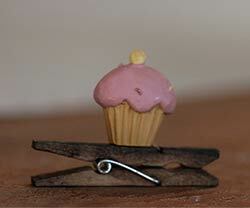 Measures 4.5 x 2 inches. Resin. Adorable pooch peeking out of a Christmas Santa hat! 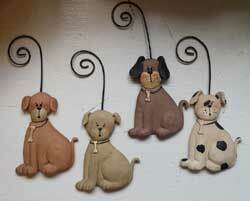 Choose the black, brown, or gray dog.